Noah had his first day of school on Wednesday. Last year, Noah was in a 2 1/2 year program and went two mornings a week. 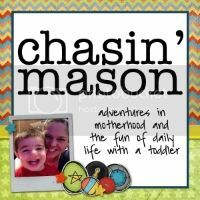 This year he's in a 3 year old class and will be going 3 mornings a week with the option of extra enrichment classes. 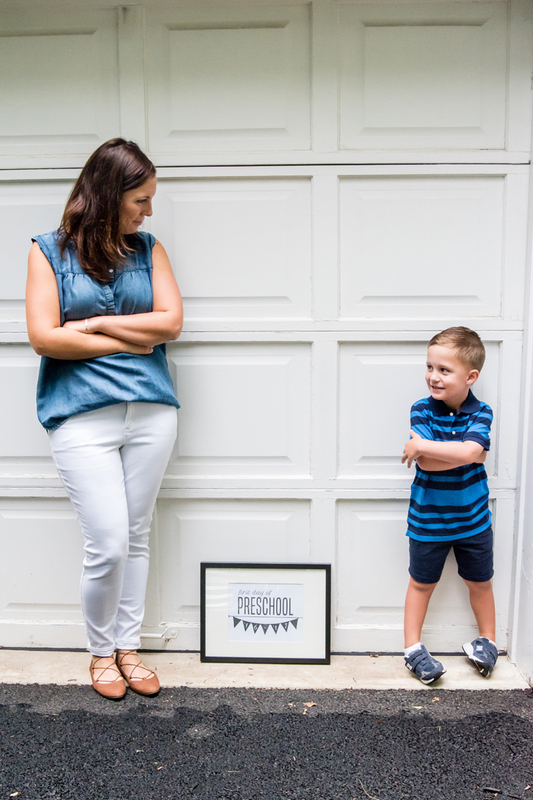 Because of Noah's fall birthday, he misses the cutoff and though he's almost 4, he will have 2 more years of preschool before starting kindergarten. To be honest, I'm relieved I get an "extra" year of him only going half days! 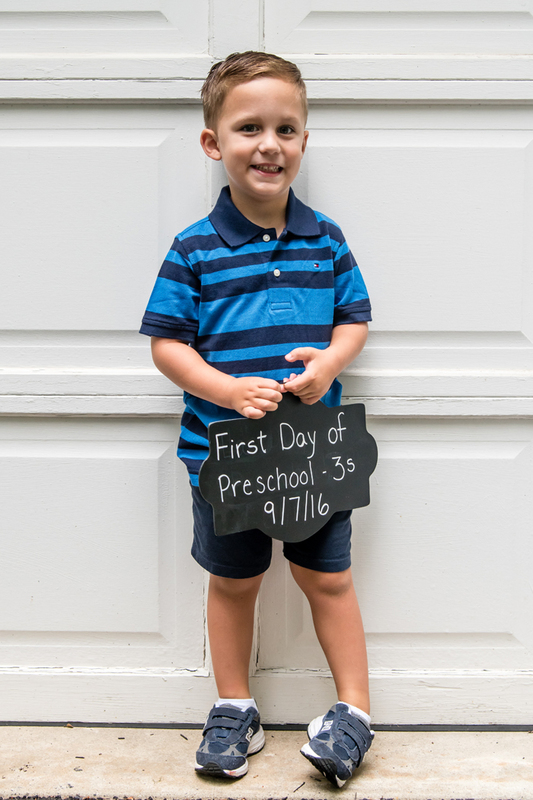 But since this was his second year of preschool, he was a pro and wasn't nervous at all! On the first day, they have the parents stay for the first hour. Last year, Noah was a little hesitant about us leaving, but this year he questioned why we even had to come and was like "see ya" when it was time for us to leave. 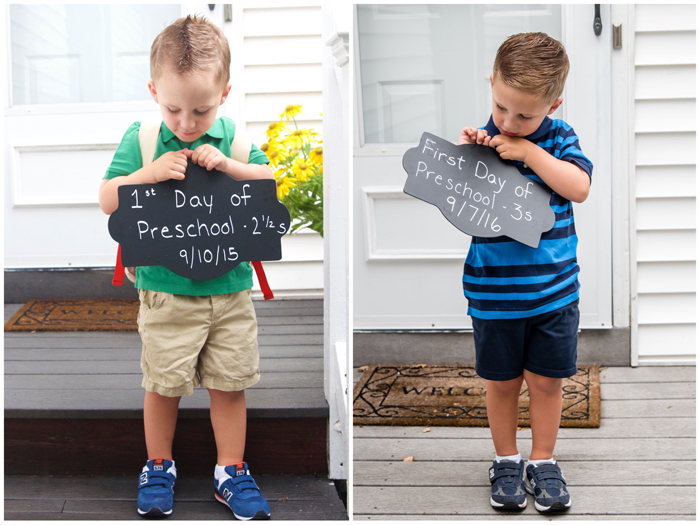 And I couldn't resist sharing a side by side of Noah's first day from last year compared to his first day this past Wednesday! 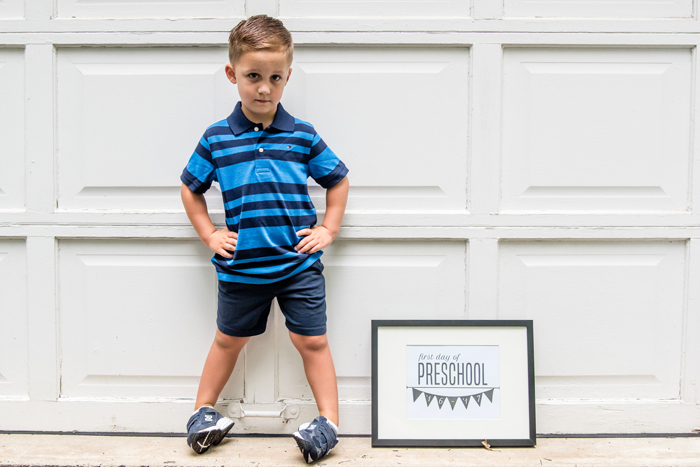 Not only has he grown in size, but he's just so much more confident about starting school. While he was pretty nervous last year, this year he was just very excited to get there! 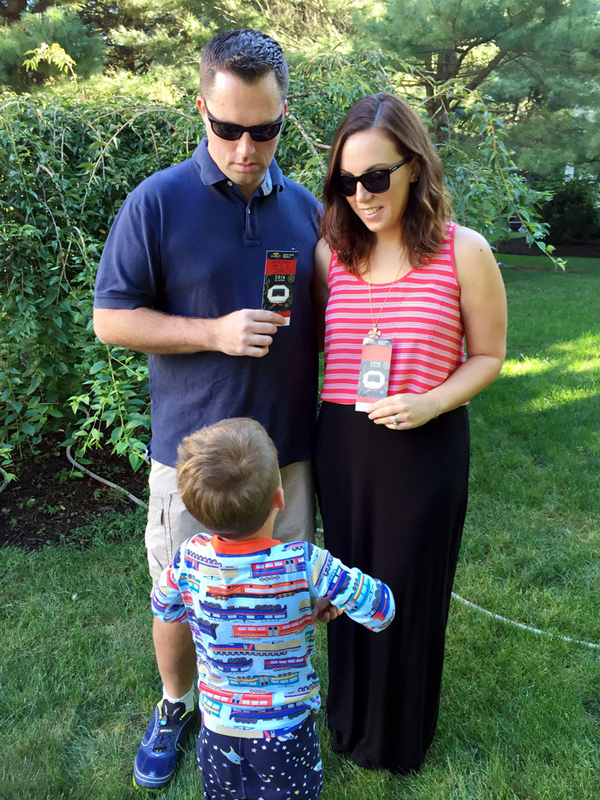 ^^^ here we are taking our traditional US Open ticket photo and Noah had something to tell us. I wonder what people driving by must have thought of his mismatched pjs with sneakers look! Labor Day Sales. I mentioned earlier this week that I got to do some solo shopping on Monday. Loft was having 60% off sale items, so I couldn't help but look. I instantly fell in love with this black polka dot top. I figured it was perfect now on it's own and since it's black, I could easily add a blazer or cardigan and wear it in the fall/winter as well. 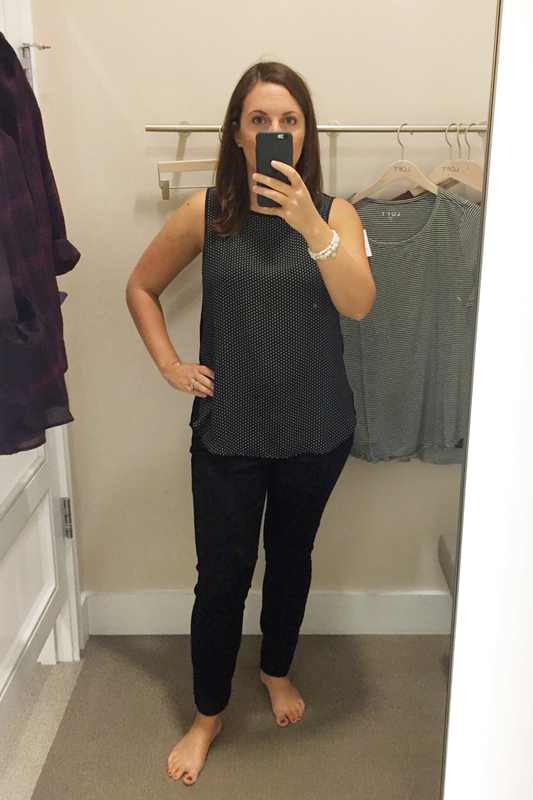 While not on sale, I'm also in love with these black jeans. I often find I have an outfit that I think would look good with leggings, but want something a little more dressed up. I'm waiting for a good sale at Loft and then I will be ordering them immediately! Loft was also having a sale on their new Fall pieces. But since I know Loft has better sales, I'm holding out. So I used this past trip as recon. I tried on a bunch of things that caught my eye online, and I'm glad I did. 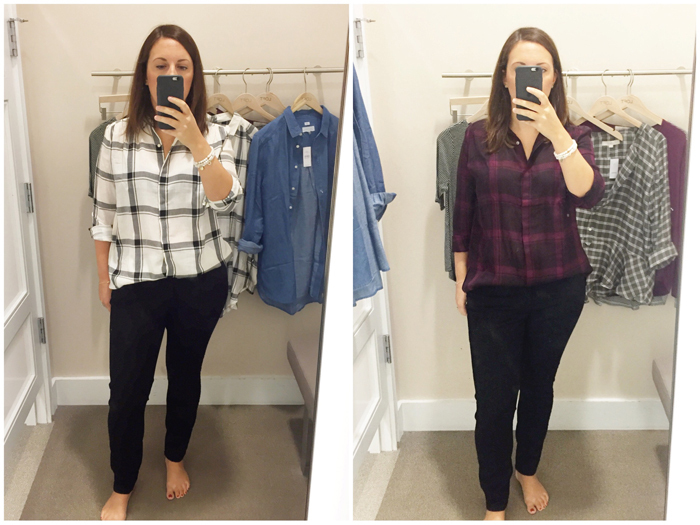 While they describe these three tops as tunics, I was surprised at how long they actually are. First off, I'm long waisted, so things usually fall short on me. Second, I sized down to a medium in these (usually a large), and they are still loose and long. So here's my question, do we like the tunic look, do they look better tucked in (as shown below), or should I just skip this style completely? I've always loved photos of the sky and panoramics, but this one is just so cool to me. We took Noah out for pizza and ice cream after his first day of school on Wednesday. When we were leaving, we noticed that to our left, the sky was very dark and looked like it would storm at any minute. But to the right, the sky was the prettiest shade of blue. We were amazed at how different the sky could look. If it had started raining, I wouldn't be surprised if we could find the spot where it was raining on one arm and dry on the other! I'm linking up with The Farmer's Wife and September Farm for "Oh Hey Friday" and with A. Liz Adventures for "Five on Friday"! 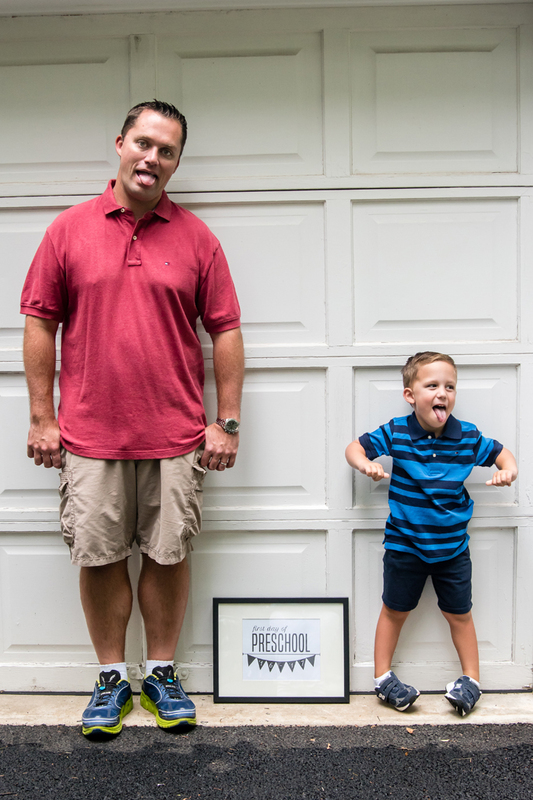 Don't forget there's still time to link up your back to school photos and posts! 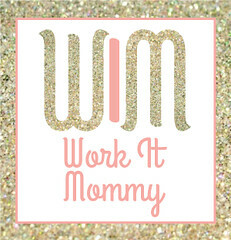 This is the perfect linkup to share and receive lots of back to school inspiration! You have until September 15 to linkup any and all back to school posts. 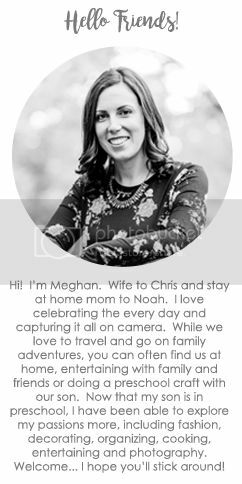 If you aren't a blogger and want to join in, use #2016B2S (B2S = back to school) when you share photos on Facebook and Instagram so we can check them out. Additionally, use that same hashtag to share any photos of your family preparing for the new school year along with any posts you may have including the topic "back to school". Grab our button and add it to your side bar, social media sites and posts to spread the school spirit this fall! Noah looks adorable on his first day. And I'm such a sucker for comparison shots. I love that he mixes his pajamas. Sounds like Cam. It kinda drive my OCD side nuts, but I have to remind myself it isn't hurting anything. Ha ha! 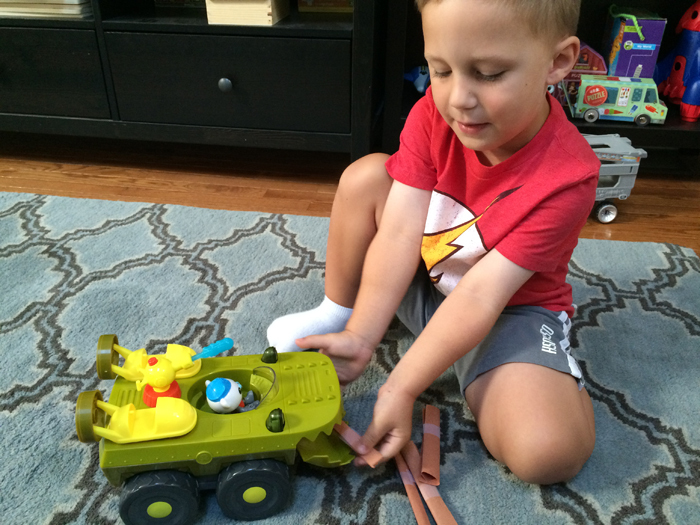 What are the extra enrichment classes Noah can have? So great that you get 2 more years before Kindergarten! Enjoy those, mama! I love all of these photos, especially the goofy ones. They show how fun and silly he is at this age! Those Hanna pajamas are so cute. I hope you find them. I like them both ways – untucked and tucked! That panoramic is awesome. What a pretty area, too! Happy Friday, friend! Love the first day of school pictures. That is so funny that Noah mixes up his pajamas! 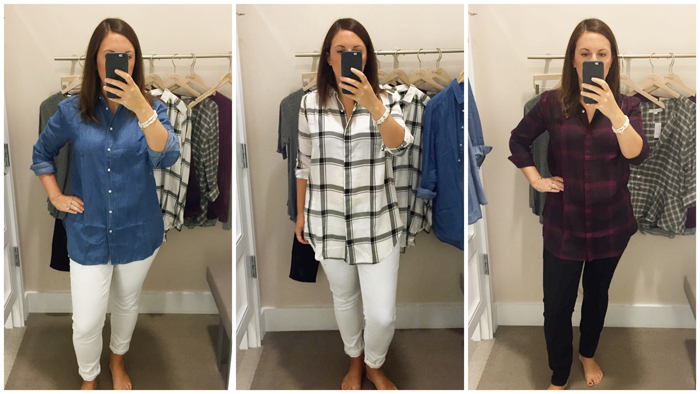 I like the tunic shirts on you both ways - you can style them multiple ways to feel like you have multiple outfits! Aaaahhh I love all the first day photos and that you got one with each of you too. Noah changed SO much last year. I remember being floored by his first and last day photos. Surely that won't happen again, right?!?! Time will tell. I hope y'all have an awesome weekend. So glad that Noah had such a great first day! I love how year 2 is totally different than year 1 in the fact that they kids are always so excited for the parents to leave lol. That Gup K is insane. I love it! Reed asked for Kwazi's Octosuit for when we move to CA so of course we have that ordered and ready to go. I also scored a random deal on the Gup I the other day from a neighbor with an Amazon store that received some damaged boxes. Brand new, but she can't sell it so she sold it to me for $5. I was way too excited about it, but I'm sure you understand! Yay for preschool! Noah is so cute. He can totally rock a little mowhawk like nobody else. I like the tunic style because like you I have a long torso and you look great with it tucked in too! I have a similar white and black plaid but that plum color is stunning. How fun is Noah?! His personality reminds me a lot like Connor!